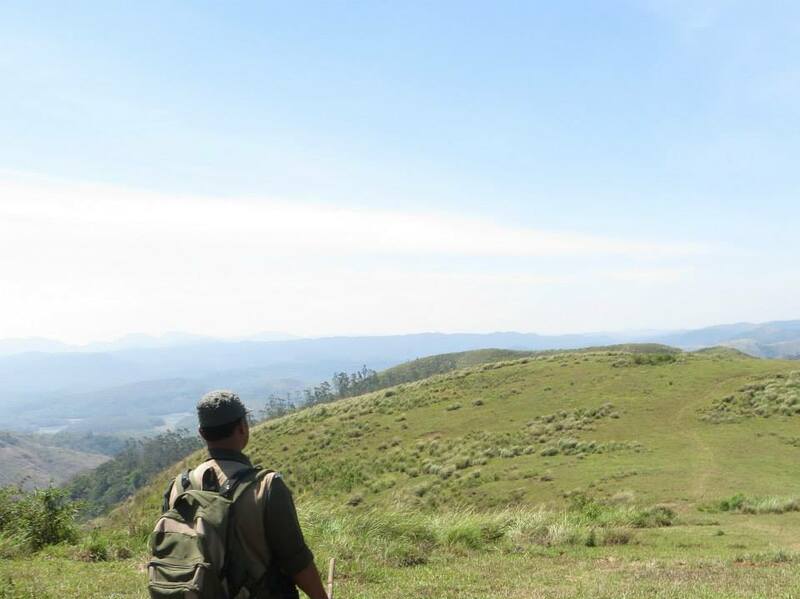 When I visited the Periyar National Wildlife Sanctuary in 2013 with a friend, we opted for an expensive and grueling 9-hour paid trek around the border of the jungle. There was a couple from France who accompanied us. We were chaperoned by four armed forest officers. Obviously I would have rather gone solo to chew on dead sunflower stems in the heart of the jungle. But I would have been dead by morning. One needs training, not tacky sentimentality, to survive in the wild. We were there because of our desperation to see a tiger in its natural habitat. Instead we were ambushed by a herd of elephants. And I ended up with one of those life’s lessons. Wild cats have been inconspicuous by their absence in my life. I still haven’t seen one. Back then it used to bother me. I used to visit crowded sanctuaries that thrive on our how deep our pockets are to show us how much beauty is out there. The road to the Periyar sanctuary is flanked by atypical tourist fare. Souvenir shops, taxi stands, hotel rooms, food stalls and massage parlors were everywhere. There is a popular yet inadvisable river boat ride that a majority of tourists opt for. It represents the worst of such experiences – crowded, noisy and sweaty with an air of negativity from people with entitlement issues. An hour into the trail, we had spotted Racket-Tailed Drongos, a Grey Hornbill and a family of Heart-Spotted Woodpeckers. We admired each of them but we kept moving on quickly, afraid that we may not have enough time to track the tiger. During the second hour mark, a gorgeous Malabar Rose butterfly landed in front of us, which I was lucky enough to photograph. And that was about the only clear sighting we had for the next 5 hours. We walked through dense forests and open plains. We went uphill until the muscles in our thighs burned. We climbed downhill through rocky terrains, holding onto our dear lives. The adrenaline rushes were exhilarating. Yet all we spotted were the usual suspects – drongos, doves and barbets. Even the forest officers were disappointed. Our luck worsened a few kilometers before the end of the trek, as we missed a Great Hornbill sighting. By the time we spotted her location, she had flown past the trees. Dejected, we sat down to have a late lunch. The guards began surveying the area. Suddenly, one of them motioned for us to crouch down and be silent. The officer next to him slanted his rifle before pointing the nozzle pointing upwards. Out of nowhere, a young male elephant dashed out a marshland, with its trunk flaring, and charged at us. The officers jogged adjacent to him, waving their arms and making loud noises. The tusker soon stopped dead in his tracks and slowly turned around. All this happened in a matter of seconds. Before our brains could separate fear from excitement, a rumbling noise startled us. He made a scary comeback, darting down a a mound, baring his trunk like fangs. He scared the wits out of a gaur calf lounging in a puddle of water Again, the tusker changed his mind and ran back up the mound. And then, one by one, his family started showing up. Beautiful and gigantic creatures swallowing the landscape with their hoof-steps. 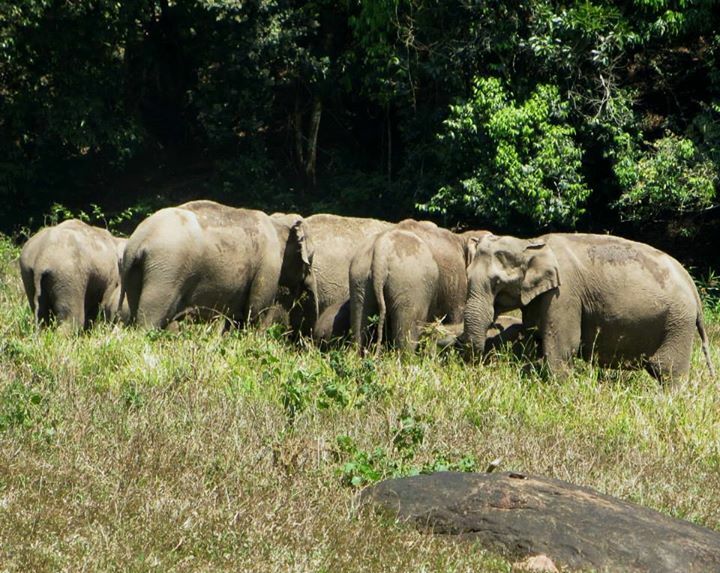 There were more than 10 elephants at a distance of 500 meters from us. They were huddled together with the littlest ones in the center. They stood there for 10 minutes just staring at us. It wasn’t creepy as much as it was overwhelming. We knew they could charge us and we wouldn’t be able to do much. Four rifles were no match for these pachyderms. We remained crouched until they began moving towards the thicker section of the jungle, with a baby elephant adorably mucking about. In 30 minutes, we were out of any clear and present danger. So we moved to a higher terrain and sat down to lunch, watching the elephants disappear. After exchanging oohs and ahhs with each other, we continued our walk until evening. There were no other wild sightings for the day. I remember finding myself lost in introspection while back in the cottage that night. I was upset that I had not seen the tiger yet I was happy that I had an encounter with elephants. I caught myself wondering if one was adequate compensation for the other. It was a silly matter to ponder about. I was wrong in thinking that I was entitled to see the tiger just because I had paid some money. It is far more important to learn from experiences in the wild than to measure it. Like Mark Twain once said – “Don’t go around saying the world owes you a living. The world owes you nothing. It was here first”. Oh no! Write one with the magic remaining too!! Please? 🙂 that’s a mighty fine idea, radhika… i shall <3! I can always count on you for a great feeling, and fantastic poems. aww the feeling is very mutual, comrade. thanks for the kindness again! someone once said, the best out of life can be a fairy tale without the happy ending. Let’s call it a happy accident. thanks! Reblogged this on Odori's Blog. Oh it was definitely as memorable of an experience as it was an experiment in terror. I was told to fear Gaurs, Bears and Elephants from the start. Thanks for the kind words comrade, it is my opinion that I stumble upon such epiphanies only with the grace and goodwill of nature herself. Do come back for more! Psshhh that’s an easy one. Door number one! Haha, I have a feeling that it wasn’t an open question. 😛 Anyway, glad to have stumbled upon your blog! What an incredible adventure. Thank you so much for sharing with us. I’m not sure I’ll ever have the finances to travel half-way around the world to sight such incredible creatures, so I count it a bit of grace to share in your adventures! Smile. Believe me, it’s my pleasure sharing these. And if you ever manage to pop by, I d more than happy to introduce you to these magnificent pachyderms and of course, our share of the birds! Thank you for your generous offer. Should I ever travel your way, I’d love to bird with you and see all of the natural wonders! Smile. It was astounding how much they respected and loved the jungle. They said that even after years and years (some of them from the neighbouring villages) of staying near the jungle, its attraction to them doesn’t change and that they still couldn’t predict when and where the tiger will be, except of course, for the summers, when all you had to do was to select a good place near a water body and wait for the tiger to come out to quench itself. It doesn’t take more than 1 trip to be committed to come back to beautiful and mesmerising places like the jungle! You could go to Bandhavgarh you know. You might get your first tiger sighting there. Because 1. Its the smallest park in terms of size and 2. It has a dense population of tigers. We also saw one there. Walking majestically past our jeep, knowing that we’re in her territory! I almost dropped the camera in fright when she looked eye to eye. Mistake number 1 because that could have been an amazing pic, had I managed to click it!! Thanks for your recount, arig! And bang on, the animals show up when they choose to. No sense in demanding that they appear just because we took the effort and time. And we all certainly need to take caution around pachyderms. Bandhavgarh sounds like an awesome place, I am sure I’ll drop by next year. I have this desire to see a wild cat in the Western Ghats, it is also where they are most difficult to spot given the size of the area. I can’t put my finger on why it is the case but it feels important to me. Hmm.. I hope the big cat doesn’t shy away from you for long in the western ghats!! All the best! Thanks arig. You’ll be among the first to know! That’s a great narration of another wonderful experience with nature. Elephants seem to be harmless or maybe they are selective in their attacks. I like them 🙂 Reminds me of Hindi movie ‘Haathi mere Saathi’. Aww most animals are harmless, Alka. Only unscrupulous development practices have made them cautious and more dangerous around us. To paraphrase the bard, the fault is certainly not in the stars but in ourselves! Also, do exercise caution around sloth bears, elephants and gaurs in India. They are among the rare ones to attack without provocation. Wonderful experience. Even my luck with wild cats has been similar to yours. But the jungle has so much more to offer. Everytime you go there it is a new and beautiful experience. Thanks meenakshi. You are right, the jungle is a veritable buffet as far as beautiful experiences are concerned. The wild cat obsession of mine is now just a memory but as someone once said in a movie – “we may be through with the past but the past ain’t through with us”. Thanks again!